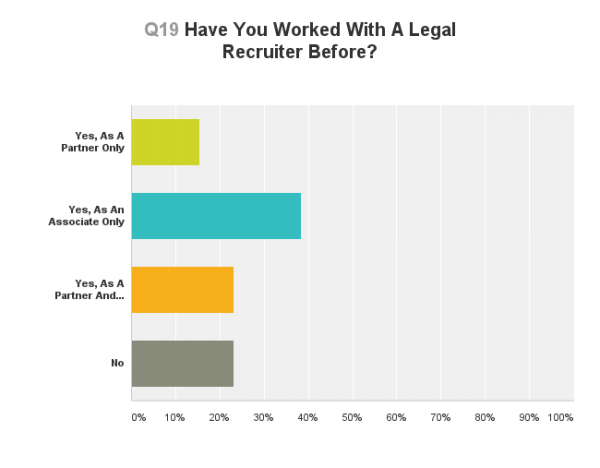 A couple weeks ago, Lateral Link asked Above the Law’s readers to tell us what they think of legal recruiters and the services they provide, and the results showed great disparity depending on the type of jobs. Attorneys seeking in-house positions were not high on recruiters in general; associates and partners perceive recruiters as providing a high level of value. Like any service, the degree of professionalism and value greatly differs from company to company, which is why I am going to break down what you should expect from legal recruiters, at least with regard to the standards that Lateral Link holds itself. Associates gave recruiters with whom they had worked high scores for market knowledge and professionalism but were less enthusiastic about the advice that recruiters dispensed or their overall value added. A good recruiter should be an advocate, confidant, interview coach, and assistant, so conducting due diligence when selecting a legal recruiter is important. Unfortunately, less scrupulous recruiters mar the reputation of the profession for others. For example, the “hawkish” approach toward lateral searches that some recruiters take struck many associates as disingenuous. And the commission structure through which recruiters get paid (essentially acting as “buyer’s agents”) resulted in mistrust in associates. Good recruiters, however, have little to gain by placing attorneys at a firm where they will not be happy. Most contracts between recruiting companies and law firms stipulate that the fee be refunded if an attorney leaves before a certain date. This is a worst-case scenario for a recruiter, and not only for monetary reasons. When a candidate leaves a firm early in his or her tenure at a firm, that firm may view warily any future submissions from the recruiter who placed the candidate, and the placed candidate will likely be unwilling to work with that recruiter again. Associates also faulted recruiters for their inability to negotiate compensation with firms. But, as ATL readers know, many firms have a lockstep compensation model and no amount of haggling will get the firm to budge from their carefully formulated structure. A good recruiter, however, can secure certain incentives such as relocation packages, which can easily extend into five digits. Some will even pay broker’s fees, fees for breaking a lease, the cost of house hunting, and even signing bonuses. Many of our recruiters have negotiated higher base salaries as well, but overall, associate compensation is rarely negotiated beyond a 5%-7% bump. 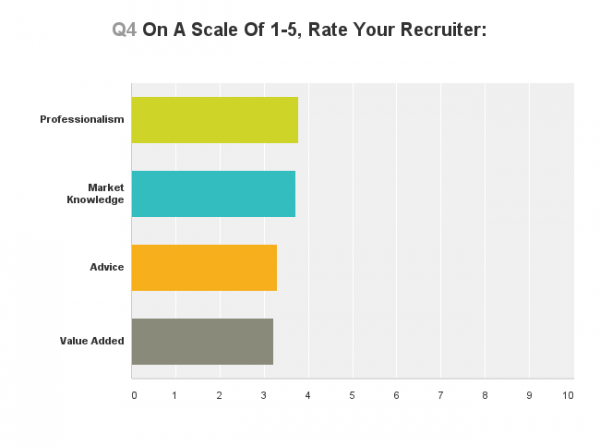 A good recruiter will offer few services more valuable than in-depth interview prep. If a recruiter has ample experience, they should be able to draw on past candidate interviews to help you prepare for the idiosyncrasies of different firms’ hiring processes. Overall, associates rated interview preparation as a middling skill of recruiters, when in reality, it should be a top one. In-house recruiters conduct searches in two different ways: “retained” searches and “non-retained” searches. Those servicing a retained search are paid by the company to fill an open position. A portion of fees for these searches are paid up front or in scheduled payments; because the company is the client, a recruiter may seem uninterested in attorneys who are not good candidates for their search. A good in-house recruiter will always field a call and help out when they can, and keep their contacts in mind when a relevant position does open up. 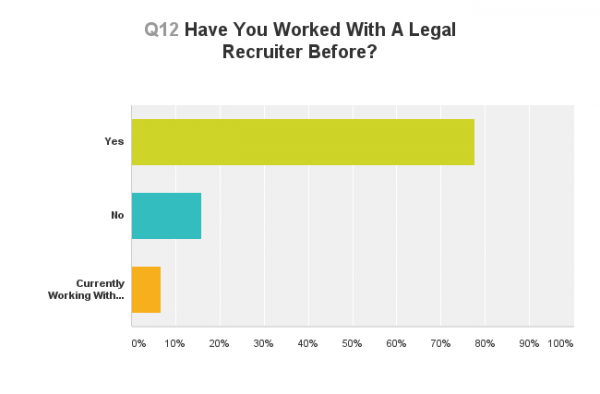 So while associate recruiters serve more as an intermediary between an attorney and a firm, in-house recruiters are more temporary proxies of the company retaining the search. Corporate compensation involves a myriad of inputs, dividends, base, bonus, equity, deferred compensation, and more. It takes an excellent recruiter to help maximize a compensation package, which often hinges on stock valuation and company performance. An experienced in-house recruiter will have the requisite experience to counsel the candidate, but inexperienced recruiters can be overenthusiastic and condition too much of a candidate’s compensation on performance incentives, or can be overly cautious and greatly reduce the potential payout. 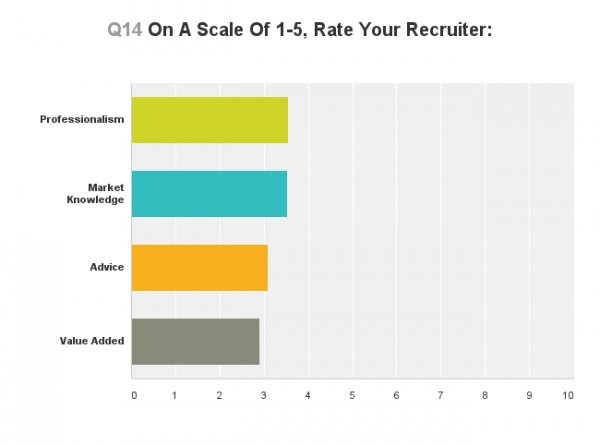 Overall, in-house attorneys were somewhat pessimistic about the advice recruiters have been dispensing. Given the business model of in-house recruiting, its not surprising that in-house recruiters might come across as self-interested. 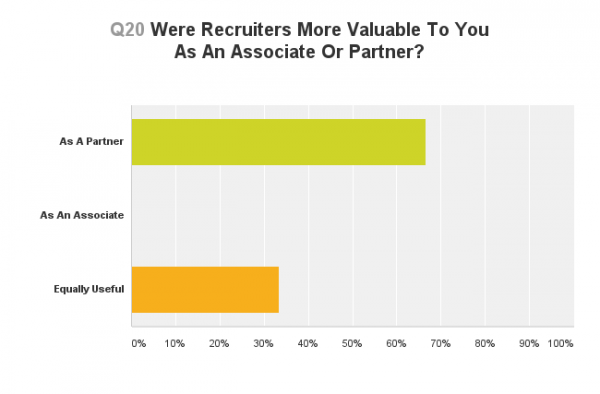 Our respondents found in-house recruiters’ corporate connections the most useful of any service listed. This is unsurprising given the relative opacity of the corporate structure; it can be difficult to find the general counsel of a firm, let alone the hiring contact. Several tools exist to expedite this search but are unwieldy and expensive to those not planning on using them to recruit. Partners are similar to in-house counsel in terms of the variability of their compensation. Most get a downward-trending percent of the business they generate, but the degree of that downward trend depends on how effective of a negotiator a partner candidate has. A good partner recruiter will not only find the partner an excellent platform to service his or her clients, but also a firm that can both accommodate the partner’s business, and compensate the partner well. It is difficult to find a firm with the requisite size, financial flexibility, liquidity, and leverage — all without conflicts. It is not surprising then, that most partners who had worked with a recruiter as an associate and partner, found them more useful on the partner level. Many partners seem unaware that good recruiters will produce (or help produce) LPQs and business plans. To the uninitiated, Lateral Partner Questionnaires or “LPQs” are documents detailing which clients a partner expects to bring and how much the partner expects to generate from those clients. Business plans, on the other hand, are more of an outline of what the partner plans to do if accepted by the firm. The plan might include target clients, forecasts, and more. Experienced recruiters are vital to this process; those experienced in partner moves know what estimates and goals are reasonable. Overselling portable clients or potential business generation could put a lateral partner out of a job in a year. A good recruiter is an advocate, confidant, interview coach, agent, and assistant all wrapped together. Unfortunately, because of low market penetration, there are bad recruiters that mar the reputation of the profession for others. If you are unhappy with your previous experience with a recruiter, give us a call, we would be happy to recommend a superlative recruiter to facilitate your next lateral move.